These NYX pencils were so darn popular when they first came out. Practically everyone with a beauty blog had a review on this. It's like when Taylor Swift's song We Are Never Ever Getting Back Together came out. On the third and fourth day after it was released, covers were popping up on my Youtube subscription box like popcorn from practically every musician I was subscribed to. (I exaggerate.) It's as if everyone in that microcosm just got a bit of Youtube musician intuition that that song was a good one to cover. It's so cool when that happens. Well anyway, here's a look at NYX Slide On Glide On pencil eyeliner in Tropical Green, which is a teal that pulls more green and has a semi-glossy sheen finish. I want to say metallic, but it's not quite to that extent. 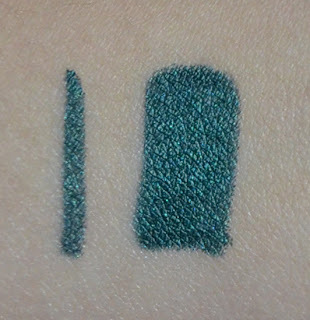 Application: This eyeliner is very very smooth, which means that it is sometimes harder to control. It has a greater tendency to make an uneven line when you don't hold your eyelids taut, which I don't because I don't want wrinkles. 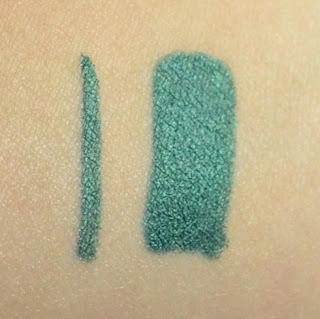 How should I say it...: Because it is so smooth and so pigmented, you naturally press very lightly and go across the lashline quickly. But in the speed and because the eyeliner slightly tugs on your skin, it often produces an uneven upper edge of the line. 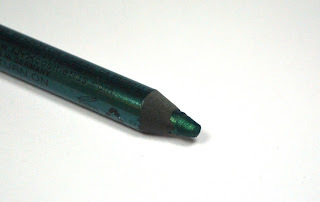 So you should apply with more care and a steady hand, as the eyeliner will literally lay color down wherever it touches. Color: It is very pigmented with a light swipe. This color is not bright. But depending what lighting you're in, it can be very conspicuous. It's so pretty! 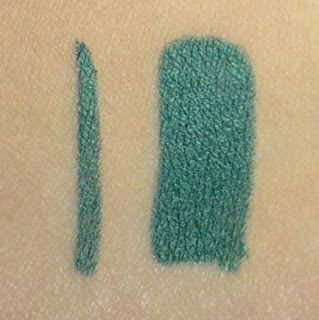 To me, this color is not a daily look kind of eyeliner, but it's a wearable way to switch things up. Bear in mind that I would wear this alone, without eyeshadow. Staying Power: Unfortunately, as expected from such a smooth-gliding pencil, you never quite feel that it dries down. It's just there. At the end of a long day, I would definitely see some of this transfer up to my lids, below the outer corners of my eyes, and sometimes in specks below my eyes. I have never quite figured out how it gets all the way down there. But in all fairness, we're talking about seriously oily skin that I have. It lasts pretty well for most of the day - only slight corner smudging and sliding at the 8 hour mark. And it doesn't fade, even with the moving and smudging. An idea just occurred to me. I think I might start applying this with a brush. The formulation is definitely soft and pigmented enough to use with a brush. With a brush, I'd get nicer-looking edges, and possibly better wear cause I won't be laying down as much excess product. I must say that the color range is slightly disappointing. A lot of the colors are light/bright and the rest are rather unoriginal. I actually also have Jewel which is a mauve/plum with pink sparkles. Jewel is not that pigmented and the glitter is rather large. These go for $8 at places like Ulta.